The family Baculoviridae encompasses a group of arthropod-specific DNA viruses that are characterized by a circular DNA genome packaged within a rod-shaped capsid and enclosed by a lipid envelope (Volkman et al., 1995). 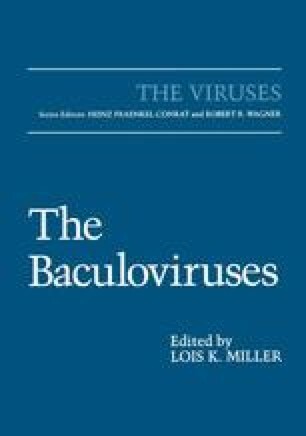 At some stage of their life cycle all baculoviruses exist as an occluded form in which virions are embedded within a proteinaceous matrix (Miller, 1996). The family is divided into the genera nucleopolyhedrovirus [nuclear polyhedrosis viruses (NPV)] and granulovirus [granulosis viruses (GV)], which differ in the morphology of their occluded virion form as well as the cytopathology they induce. The occlusion matrix proteins polyhedrin (NPV) and granulin (GV) are closely related and highly conserved, and have been used to assist in the taxonomy of baculoviruses (Rohrmann, 1986a, b; Zanotto et al., 1993). NPV have polyhedral-shaped occlusion bodies, 0.5–15μm in diameter, which contain many virions embedded either as single nucleocapsids per envelope (SNPV) or multiple nucleocapsids per envelope (MNPV), and morphogenesis occurs within the nucleus of infected cells. In contrast, GV produce much smaller ovicylindrical occlusions (capsules, 0.16–0.30 μm × 0.30–0.50 μm) that contain one or occasionally two virions. Replication of GV begins in the cell nucleus but induces apparent breakdown of the nuclear membrane, such that morphogenesis is completed in the cytoplasm or hybrid cellular compartment (Crook, 1991; Granados and Williams, 1986).